Mitch Duncan has had a strong game today with 22 disposals at a disposal efficiency of 73 percent, 13 contested possessions, 10 ground ball gets, six clearances and six scoring involvements. Kane Lambert has had a strong game today with 24 disposals at a disposal efficiency of 79 percent, 10 handball receives, 416 metres gained and 10 scoring involvements. 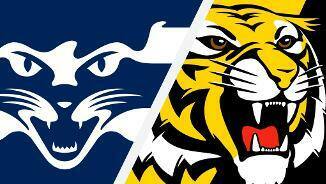 Richmond has been able to hit the scoreboard from throwins today outscoring Geelong, 3.2 (20) to 1.2 (8). Joel Selwood has had a strong game today with 24 disposals, eight contested possessions, 12 handball receives, six inside 50's, 399 metres gained and one goal. It has been an even battle in the ruck tonight with Rhys Stanley and Toby Nankervis in a deadlock of 26 hitouts each when opposed to one another. Stanley has 10 hit outs to advantage while Nankervis has 8. Geelong has been strong when the ball has been on the ground, leading groundball gets 90 to 86. Mitch Duncan 10, Patrick Dangerfield 9 and Tim Kelly 8 have lead the way for the Cats tonight. Richmond's Alex Rance has played 100 per cent of the game this afternoon, the most out of everyone on the field. Mark Blicavs has spent 97 per cent. Cats InterchangeLincoln McCarthy and is possibly out for the game. Richmond's disposal efficiency of 67 per cent is lower than their seasonaverage of 71, they are ranked 15th across the season. Geelong's kicking efficiency of 54 per cent is lower than their seasonaverage of 66, they are ranked 4th across the season. Cats InterchangeLincoln McCarthy off due to an injury. Richmond has been able to hit the scoreboard from stoppages today outscoring Geelong, 2.4 (16) to 1.3 (9). The Tigers have kicked six out of the past eight goals in the match. They have been in the lead since the 26th minute mark of the second quarter. 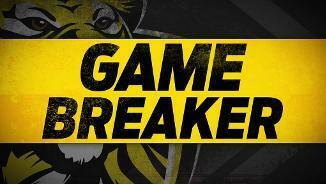 Tigers InterchangeJack Riewoldt off due to the blood rule. Richmond has focused on Jack Riewoldt as its key target inside 50 this afternoon, targeting him a teamhigh seven times for a return of two goals (2.0). Jayden Short has gained 300 metres for the match, with Shaun Grigg 295 and Jed Bews 271 the next best on the ground. Richmond leads the tackle count by eight for the quarter. Trent Cotchin and Jack Graham have been influential with three each. Geelong has dominated the clearances 1610. Gary Ablett three, Mitch Duncan and Joel Selwood two each are the most prominent on the ground. Richmond has 13 more effective disposals than Geelong for the match so far. Kane Lambert (7) and Daniel Rioli (6) have been the most prominent on the ground. Cats InterchangeMark Blicavs off due to the blood rule. Daniel Rioli has had a strong first quarter in his first match of the year with five disposals, three contested possessions, three tackles and two inside 50s. Cats InterchangeTom Stewart off due to an injury. Richmond has been inaccurate in front of goal this quarter scoring 1.5, they have missed all their scoring shots from between 4050 metres. Richmond's forward pressure has been far better than Geelong's, applying nine tackles to zero inside the forward 50 this quarter. Daniel Rioli is leading the way with two. Rhys Stanley has won the hitouts 51 when he has been opposed to Toby Nankervis this quarter. Richmond leads the contested possession count by eight for the quarter. Jayden Short, Dan Butler and Jack Riewoldt have been influential early with three contested possessions each. Jake Kolodjashnij recorded a careerhigh five intercept marks last round. He has also won 39 per cent of his defensive one-on-one contests this season ranked third of the top-30 players to be involved in a contest. Josh Caddy has recorded a shot at goal accuracy of 75 per cent this season the secondhighest percentage of the top-20 goal kickers in the AFL. Geelong has conceded 66.7 points per game this season ranked No.1 defensively. Reece Conca has forced the opposition to commit 48 turnovers as a result of his pressure acts this season ranked eighth in the competition. Welcome to MCG for the Geelong Cats v Richmond Round 13 clash. RICHMOND has outlasted Geelong in a titanic struggle on a rain-sodden MCG on Sunday, piling on four goals to one in the final term to win by 18 points. The Tigers led by just one point at three-quarter time after the Cats threw down the challenge to the reigning premiers by kicking three of the third term's final four goals. But, as it has done so often in final quarters this season, the Tigers found an extra gear when it mattered. Early goals to Jack Riewoldt and Dustin Martin quickly put them 13 points up and they were never seriously challenged after that, grinding their way to a 12.11 (83) to 9.11 (65) victory. The Tigers' last-quarter charge was sparked by a Jake Kolodjashnij error at the five-minute mark that will likely give the defender nightmares for some time. After taking a strong mark across half-back, Kolodjashnij shanked an attempted kick off one step. 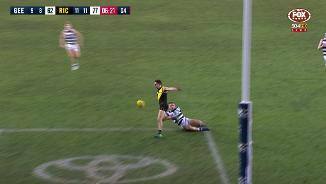 The Tigers pounced on the loose ball and pumped it forward where an inspired Dan Butler chip pass set up Riewoldt to snap truly on his left foot. A minute later, Martin repeated the dose with a snap of his own and the Tigers had more than enough momentum to carry them home. The Tigers' win put them back on top of the ladder (although second-placed West Coast has a game in hand), while it was their 16th consecutive win at the MCG, a streak that began in round 14 last year against Carlton. Nick Vlastuin was outstanding for the Tigers across half-back, taking a game-high 11 marks in slippery conditions when other players were struggling to hold their grabs. Shane Edwards (21 possessions and seven clearances) continued his excellent recent form through the midfield, while Dustin Martin (22 disposals, five clearances and one goal) was influential on his return from a calf injury after a slow start. Dylan Grimes made life tough for Geelong's forwards in his typically understated way, while Kane Lambert (24 possessions and one goal) and Shaun Grigg (20 possessions and seven inside 50s) were important ball-winners for the Tigers. 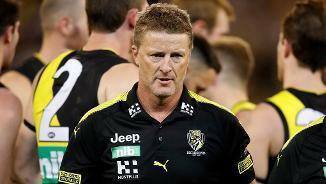 Richmond coach Damien Hardwick took plenty of satisfaction from defeating "a quality opposition". 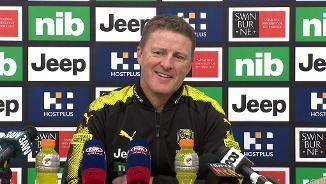 "It was an arm wrestle all day, conditions made it tough, their formation behind the ball is very strong," Hardwick said. 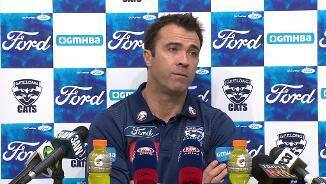 "For our guys to respond when Geelong were coming in that third quarter and to gain ascendancy was really important. "Trent (Cotchin's) last quarter was pretty special. I thought he led from the front and managed to will us over the line." The Cats' loss was their third from five games at the MCG this year and puts their top-four hopes in jeopardy. After starting the round in fourth place, they have now slipped to fifth behind Melbourne on percentage, while Collingwood (fifth) and Port Adelaide (sixth) will have the chance to climb above them next round when the Cats have a bye. 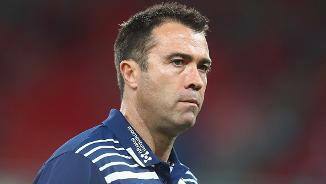 Geelong decisively won the clearance count 45-32 and the centre clearance count even more emphatically 18-6, and coach Chris Scott said his team simply hadn't been able to take advantage of that dominance. 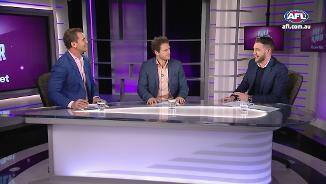 "Even the clearances around the ground we were on top for a lot of it, but the penetration they got from the boundary throw-ins, in particular, was better. We were plus-12 centre bounce clearances, plus-nine inside 50s, (but) just not as good at the fundamentals as what they were," Scott said. "It felt a tight game for the most part generally, the difference was they were just able to make the most of some of their opportunities and were really strong at the fall of the ball. "Their dangerous small forwards were good, they took their chances. We did have chances to play the game up in our forward half, but it was probably best reflected in the third quarter where we dominated, I think it was plus-11 inside 50 entries, but they were still able to get some open chances the other way." 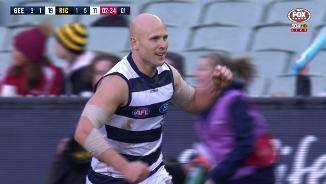 Gary Ablett (25 possessions, seven clearances and one goal) was outstanding on the big occasion and was well supported through by the midfield by captain Joel Selwood (29 possessions, five clearances and two goals) and Mitch Duncan (22 possessions and six clearances). 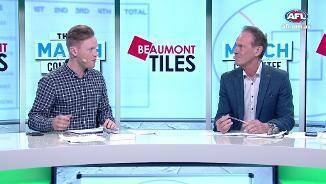 Tom Stewart (24 disposals and seven rebound 50s) provided an attacking springboard in defence, while Mark Blicavs largely kept Jack Riewoldt in check and Tom Hawkins booted three goals on a difficult day for key forwards. Geelong: Tom Stewart hobbled from the ground late in the first term with a sore ankle and headed into the rooms to be assessed. The defender returned to the ground at the start of the second term and played the remainder of the game without any obvious signs of injury. Lincoln McCarthy went into the Cats' rooms late in the third term after suffering a hamstring injury and played no further part in the game. Coach Chris Scott said after the game it was too early to tell the severity of McCarthy's injury. 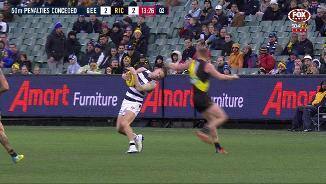 Richmond: Jack Riewoldt came from the ground early in the third quarter under the blood rule after suffering a cut to his face but was back on the ground five minutes later. Both teams will enjoy a bye next round. The Tigers will resume in round 15 with a Thursday night clash against Sydney at Etihad Stadium, while the Cats play the Western Bulldogs at the same venue the following night.